This project examines the economically feasible biomass supply for different types of future bioenergy, biofuel, and bio-based product manufacturing facilities sited across the landscape. This assessment extends that work by identifying supply curves (cost of supply by quantity delivered) (courtesy of California Biomass Collaborative). California has a large and diverse biomass resource base that could potentially provide the state with renewable energy, according to research from the California Biomass Collaborative. Feedstock for biomass energy production in California comes from forestry and forest products; agriculture; and urban sources, such as municipal wastes. Biomass may also emerge in the form of new crops as the state moves to reduce consumption of fossil fuels and petrochemical feedstock and use more sustainable and renewable resources for energy and products. In a recent report, the California Energy Commission asserted that dedicated biomass crops for energy, fuels, chemicals, and other bioproducts may develop given sufficient market incentives or in association with new agronomic practices. 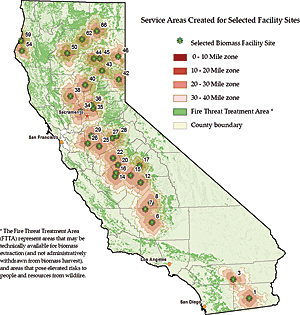 The California Biomass Collaborative used ArcGIS Desktop software to examine the economic feasibility of biomass supply for different types of manufacturing facilities of future bioenergy, biofuel, and bio-based products. The collaborative is made up of researchers from the California Energy Commission and the University of California (UC), Davis. The data used for the study was provided by the California Biomass Collaborative, California Department of Forestry and Fire Protection, California Department of Water Resources, California Energy Commission, UC Davis, and Esri and included previously assessed data about gross and technically feasible feedstock supplies. Using the ArcGIS Network Analyst extension, researchers identified feedstock supply zones within fixed distances of each facility site. The actual distance along the road network was determined, as contrasted with simpler analyses employing a fixed radius and tortuosity factor. 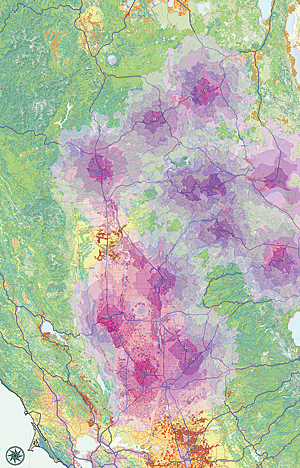 Researchers accumulated area in acres for each resource polygon to yield the total area within the supply region based on transportation distance. By adding cost information per road and feedstock type, the team was able to determine total delivered feedstock cost. The team identified supply curves—the cost of supply by quantity delivered—and added cost information by road class and feedstock type. The resulting data allows optimization of facility scale or size by satisfying different requirements such as the minimization of delivery cost and the maximization of facility profit. Facility size optimization was evaluated by combining feedstock delivered costs with economies of scale for capital and operating costs. Using the ArcGIS Spatial Analyst extension, the team was able to provide future developers with a map of supply overlap to assess potential competition for feedstock among facilities. The GIS work of the California Biomass Collaborative may support statewide efforts to attract developers and include biomass as a viable renewable resource to meet state energy demands. For more information, contact Lian Duan, GIS mapping/GIS specialist, California Department of Forestry and Fire Protection (e-mail: lian.duan@fire.ca.gov).